As digital attacks continue to grow in sophistication and strength, cybersecurity technologies meant to shield against them improve as well. These technological advancements, however, take place at a pace far faster than the human mind can evolve, producing a situation in which humans increasingly become a potential Achilles Heel. As one would expect, therefore, successful forms of attack have increasingly relied on leveraging human weaknesses as opposed to simply exploiting technological vulnerabilities; in fact, the vast majority of major breaches in recent years have been achieved through the use of cyberweapons that exploit some element of human error. This presentation will examine several growing threats, how they successfully exploit human weaknesses to become successful as attack vehicles, how they mimic physical attacks and earlier generation cyberattacks, and how we can employ not only technological countermeasures, but leverage human psychology and other disciplines to more successfully combat them than ever before. 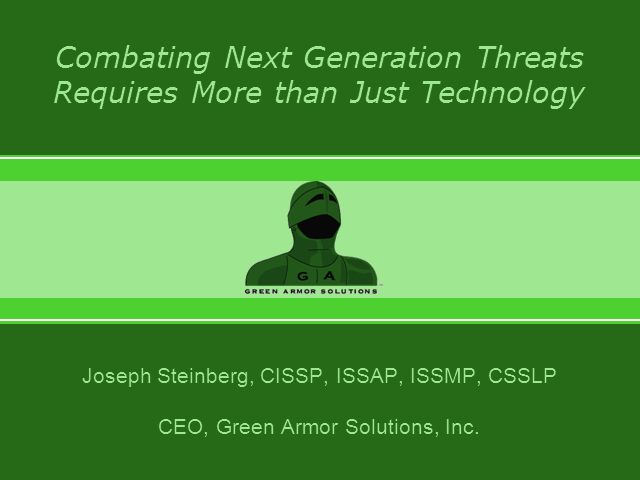 Joseph Steinberg (CISSP, ISSAP, ISSMP, CSSLP), CEO, Green Armor Solutions, Inc. Presented by: Joseph Steinberg (CISSP, ISSAP, ISSMP, CSSLP), CEO, Green Armor Solutions, Inc.